He calls himself a member of the lost tribe - an under-appreciated group of doctors working at the coal face of the NHS. But anyone spotting part-time forensic medical examiner Dr Meng Aw-Yong riding his motorbike might be forgiven for mistaking him for a member of the California Highway Patrol. In fact the staff grade associate specialist - or SAS - doctor is speeding between call-outs to the various police stations where he checks the fitness of suspects to be interviewed. 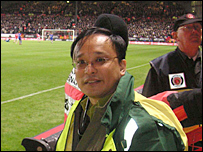 But Dr Meng, as he is known to his patients and friends, also has another incarnation as crowd doctor at Charlton and Queen's Park Rangers football clubs. Fans might see him tending to members of the crowd who have fallen ill during the game - and not just because they disagree with the referee. Perhaps surprisingly, these demanding roles do not even constitute his main job. That is reserved for the accident and emergency department of London's Hillingdon Hospital where he works three days a week. "People say you are busy - my other half says I should cut down on my work. But the really nice thing is that we are working with the people," says Dr Meng. 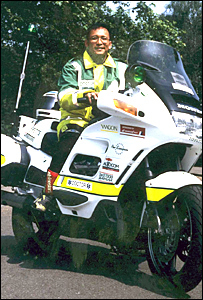 "It makes you feel great in A&E when an old lady says thank you - it really makes your day." We all saw what happened in London on July 7. I suspect a terrorist attack like that may happen again. So I hope I will be able to take my experience to it. So how is he able to do so much? The answer lies not only in enormous reserves of energy, but in the strange in-between grade that Dr Meng belongs to. As an SAS doctor he is able to build up specialisms that are useful to the public such as dealing with major incidents and crowd control. He was working during the Millwall - Birmingham football riots three years ago. "We had about 50 officers injured, lots of arrests, horses had to be put down and we were right in the middle." Experience of dealing with a situation like this would be of assistance in helping in a major terrorist incident for example, he says. "We all saw what happened in London on July 7. I suspect a terrorist attack like that may happen again. "So I hope I will be able to take my experience to it." But SAS doctors like Dr Meng, who make up almost half of the A&E doctors and around a quarter of the country's surgeons, say they feel undervalued. And their campaign for recognition is being backed by the British Medical Association, which has released a dossier entitled; "The Hidden Heroes of the NHS". Slotted in between junior doctors and consultants, SAS doctors say their contribution at the NHS frontline is under-valued and they are in negotiations for a new contract. Dr Meng explains that while junior doctors signed a new contract four or five years ago, which gave them higher pay, shorter working hours and protected education and training, SAS doctors were ignored. "Many of us are being paid less than the junior doctors that we supervise. "Our main concern is that we have been left out in terms of career progression and educational needs and training. "Many of us would like to see an acknowledgement of the important contribution that we give to the NHS." Dr Meng stresses: "I am not fighting for myself - I am fighting for others. I am nearly 40 and do lots of things. "But we are really trying desperately to halt the departure of doctors from A&E." A decision on the new contracts is due in April. But in the meantime, Dr Meng's mind is on this week's game at The Valley between Charlton and Liverpool. As a committed Liverpool fan will he be able to keep his eyes on the crowd? Dr Meng: "I've got two eyes - so I'll have one on the job and another on the game."